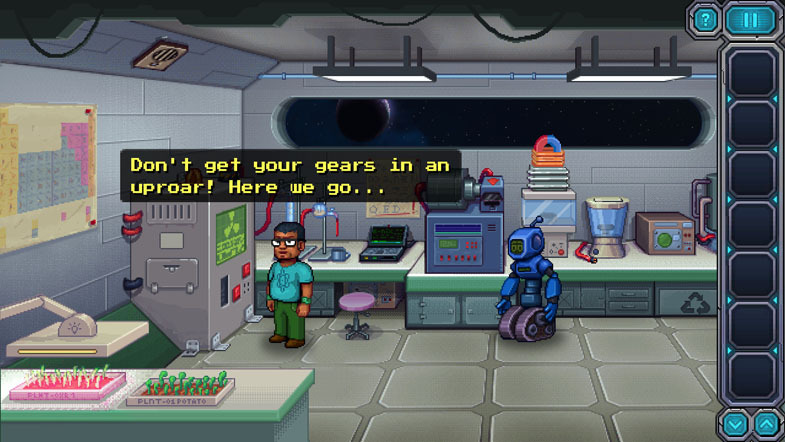 Developed by Pavel Kostin and published by HeroCraft, Odysseus Kosmos and his Robot Quest is a 2-D point-and-click game with a retro twist. It follows engineer Odysseus Kosmos (Oddy) who’s lived aboard an enormous spacecraft for years and who has for only companion a snarky robot named Barton Quest. The introduction to your hero comes with Barton trying to find the elusive character. Which makes sense. It’s a massive ship, though we’re only given a small glimpse in this first episode. When Barton finds Oddy, you learn he isn’t the most motivated individual unless he puts his mind to something meaningful. Such as, reconfiguring the atomic synthoreplicator to make coffee while having a perfectly good coffee maker in his room. Barton, on the other hand, has more of an edge to him. There we find him standing at the doorway looking begrudgingly, like an impatient mom blocking the door until you have completed your chores (see also wife)...which is when the whimsical repartee and shenanigans in the form of somewhat obtuse puzzles begin. Fantastic art and dialogue a given, enigmas. A puzzle game is a constant balance between being challenging and solvable. You may need to do some mental gymnastics but once figured out you need be able to understand why it made sense. Odysseus Kosmos and his Robot Quest, like many puzzlers, is a sliding spectrum based on the individual task. On the one hand, you have fun mini puzzles when repairing equipment or flying craft through space that doesn’t belong in it. On the other, you’ve got more difficult problems to work through which takes a specific order. Here is an example of this, without spoilers of course. The text says ‘This whosiwhatsit needs a dillybopper.’ Well, that’s convenient because you have both of those things. So you take the dillybopper, put it on the whosiwhatsit and it’s no good. It won’t work. However, after walking around the ship for a while, you take the whosiwhatsit and put it on the dillybopper, and THAT works. The moral of this story is 1. Don’t let me name things in your game and 2. If you’re sure that these things go together, try them every way possible such as putting something down first and then combining them. The doughnut reserves are OK! Most of the care and attention to this game was put into the dialogue between Oddy and Barton. This interpersonal dynamic between an impolite robot and an unmotivated engineer is the best part of the game. It's also the only way we get any character building and backstory. You get from Barton that Oddy is lazy because Barton pointedly asks why he is that way, which tells of the robots nagging characteristics. Then while solving problems on the degrading ship, you also find out that there were others on board the ship… You hear of an incident… The information is sprinkled sparsely through conversations that can be quite lengthy, and while the temptation may be strong, do not skip them. You’ll run the risk of missing some critical details. Ultimately, the game’s visually appeal is what makes it work. 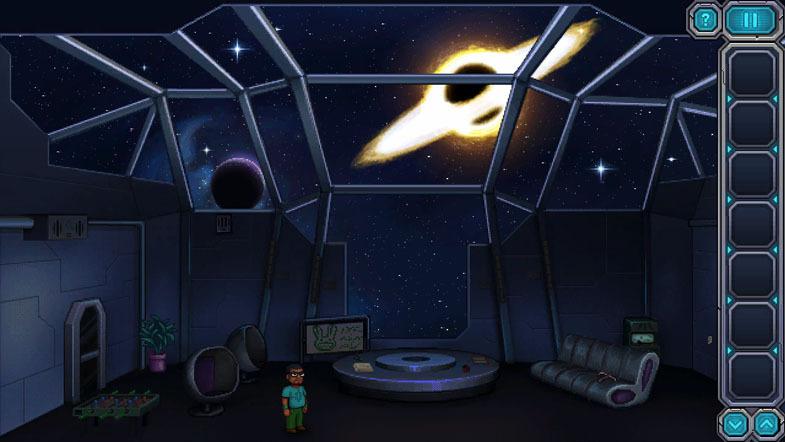 It harkens back to the olden days with classic point and click puzzlers such as Space Quest, yet looks sharp and updated. The model for Oddy is the exact visual representation one would expect from a person motivated to get work done by an offering of doughnuts, of whom I consider myself to be in similar company. Characters and sprites complement the backgrounds perfectly. Odysseus Kosmos and his Robot Quest is a charming title and a solid first entry into an episodic series. The old school pixel graphics and humorous banter give the game a human touch, while it gets hurts by dialogue that feels long winded at times. As a narrative-driven point-and-click the story is paramount, and while the puzzles are interesting there isn’t much character development or narrative so far. Just enough to keep you hanging on for further episodes.